Where is the ventral tegmental area? 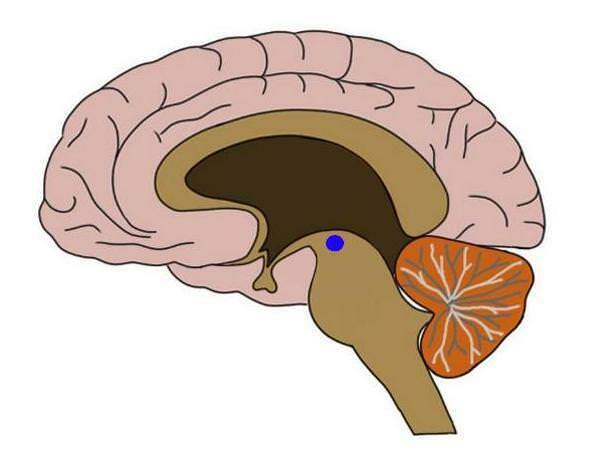 location of ventral tegmental area indicated by blue dot. The ventral tegmental area, or VTA, is in the midbrain, situated adjacent to the substantia nigra. Although it contains several different types of neurons, it is primarily characterized by its dopaminergic neurons, which project from the VTA throughout the brain. The VTA is considered an integral part of a network of structures, together known as the reward system, that are involved in reinforcing behavior. What is the ventral tegmental area and what does it do? The VTA is one of the two major dopaminergic areas in the brain (the other being the substantia nigra). Although there is not a very clear anatomical separation between the VTA and substantia nigra, the areas do seem to differ slightly in where most of their neurons project to. The largest bundle of fibers leaving the substantia nigra, known as the nigrostriatal pathway, projects to the caudate and putamen (together known as the striatum). There are several major efferents that project from the VTA; two of the most prominent are the mesolimbic and mesocortical pathways, which travel to limbic and cortical areas, respectively. Watch this 2-Minute Neuroscience video to learn more about the VTA. The variation in the destination of their efferents leads to a divergence in the functions attributed to the VTA and substantia nigra. While the substantia nigra is primarily associated with movement, the VTA is thought to be involved with various cognitive and emotional processes. The functions associated with the VTA are diverse, but it is probably best known for the major role it seems to play in motivation, reward, and addiction. When someone uses a drug of abuse, or attains some otherwise rewarding stimulus, dopamine levels typically rise in the nucleus accumbens, a structure found in the basal forebrain that is an important part of the reward system. The primary source of dopamine in the nucleus accumbens is neurons that project from the VTA and travel in the mesolimbic pathway. Thus, the VTA is also activated when one experiences something rewarding, and this integral role in the mediation of rewarding experiences has caused some to propose that activity in the VTA may be necessary to the development of addiction. Dopamine is also important to normal cognition and so it is not surprising that the VTA has been implicated in the pathophysiology of disorders other than addiction. For example, dopaminergic neurons in the VTA have been proposed to play a role in schizophrenia, a disorder that is thought by some to be associated with high levels of dopamine. Alternatively, attention-deficit hyperactivity disorder (ADHD) has been linked to low dopamine activity in the VTA. In truth, the dopaminergic projections from the VTA are so extensive that they are likely involved to some degree in a wide variety of normal and pathological behavior, but it is still not very clear exactly what role they play in most cognitive processes---both normal and disordered. It does seem clear, however, that due to the importance of dopamine signaling throughout the brain and the widespread dopaminergic projections of the VTA, the integrity of the VTA is crucial to proper brain function.